We're nearing the end of the year and one must ask now - was 2008 the year of AROS? Looking back at some of the remarks ans discussion about AROS , it looked like AROS was near completion (which wasn't) and that a lot of users and developers would join the the AROs effort. There was two major points which were catalyst for these statements. AROS native in SAM440 was regarded as a major step to make AROS more universal, and a Operating System across platforms. Hitting the PPC architeture was also a proud statement of ARO regarding hardware support. AmigaOS4 being tied to AmigaOne and lack of hardware for MorphOS was a critical point to both closed source OS. So people started to believe that AROS was actually going to make it where others didn't. Still it was a significant success that changed many people opinion about AROS altogether. The Open Source Browser work was conducted by Robert Norris, and his past record quickly made the project a huge success in all the forums. Traveler was going to be the name of the AROS App running a port of the Webkit. It reached pretty far with a simple app launching the Webkit work done so far. Then Robert Norris began to feel that the AROS wasn' aiming high enough, and proposed a fork from the main AROS dev tree. Then alleging personal issues he abandoned the AROS and the Traveller project. That was a painful time for AROS and it sure hurt all the AROS people who saw the exit of a coding genius with sorrow. The lack of a decent browser also hurted the AROS intended respect in the OS area. But he left a near complete port of the SQLITE, CAIRO and WEBKIT engine among other important libraries, and that's something that will not doubt have significant impact future development. E-UAE Integration was also a early bounty, and one that promised a lot since it was Richard Drummond (the E-UAE author). And there was a lot of optimism since early statements from Richard seemed to indicate it to be a relatively easy and almost complete. But time gone and no word was heard from Richard anywhere. Even E-UAE stopped dead. In the mean time a lot of effort was directed to AROS itself and provided validation of the FFS partitions, improvement of the Installation procedure, ata.device, format utility, wanderer features, making AROS really usable. More apps and games were ported, including a MMPORG client Eternal lands. VmwAROS reaches version 0.91 and shows what AROS is all about! Above all AROS is now self compilable - now that's something milestone and thanks to Stanislaw Szymczyk. So more than hype and simple achievments AROS introduced serious and important core modifications which will make future development a bit more solid (hopefully). Present status has 6 bounties open and they promise a lot. - Port AROS To EFIKA & USB Mass Storage have been taken by Dr. Michal Schulz. More PPC platform development means more universal AROS, and the USB mass storage device will make the native versions independent and really usable. - Port AROS to run on Windows/Cygwin is underway, and promises to provide the Windows devs more easier system to set up (Amidevcpp is pretty usable and standard for cross platform development). Regarding the Open-Source Browser, Stanislaw is already working on the Netsurf port. We might get a decent browser in AROS before 2009 - keep your fingers crossed! As for the E-UAE integration thanks to Paolone Besser (AmiBridge) and O1i work we might just see it in the near future. New GOD on the block! So I've been working on the update of the AROS Manuals, doing some Locale adding in AROS (added a few countries and flags), working on the translation of some catalogs to Portuguese. When I woke up this morning I found a cryptic post in AROS-EXEC by damocles, which would turn my mind upside down. There's a new name on the block regarding AmigaOS Family OSes. It's name is Anubis (The ancient Egyptian God of Death - no comments as every is already been made!) and it's main premise is to build an Amiga like OS on top of the linux kernel. More info also on the #anubis irc channel in freenode. I can't quite express myself, but let's face it AROS lack of developers, and lack of interest by most of the Amiga Community always plagued it's advance. Still it got where it's reckoned as a wonderful reincarnation of the AmigaOS original API (but a lot better). However the lack of direction, some technical issues and it's proposed roadmap wasn't helping the advance in future. Everyone always asked, and when AROS reaches 1.0, what then? It's not new, (check an old entry in this blog) a fork was once proposed by AROS developers and although Rob Norris did not refer to it as the reason as for leaving AROS, it had it's significance no doubt. Dr. Michal Schulz also sided with Rob on this subject at the time, and he had already expressed it's wish to leave AROS, so it should be no surprise his involvement (although I admit it was a bit shocking for me at first glance). A next generation OS which aims to be hardware independent requires hardware drivers. Linux kernel has them in plenty... That combined with a more pragmatical attitude regarding other technical issues which plague the development of AROS and AmigaOS in general. 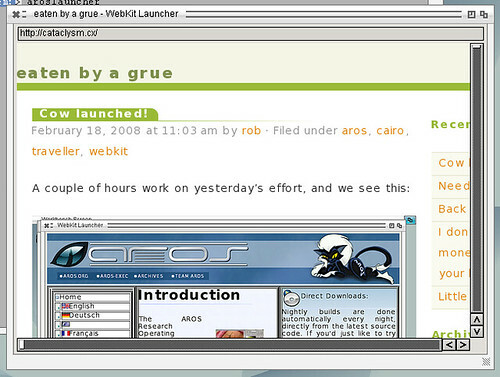 So the move towards Anubis (arix in sourceforge) is not entirely surprising, and makes general sense. Does this means the end for AROS? Not according to the people behind Anubis - they're entirely diferent projects which have their own space. AROS might shape to be the best AmigaOS encarnation in any and all platform available. Anubis is aiming a bit higher and not compromising with AmigaOS altogether. I just would like to say: GOOD LUCK ANUBIS-TEAM!